Quito Hotel is located just minutes from downtown of the city and just 20 minutes from Mariscal Sucre airport, on top of a hill, where you can watch the Ecuadorian capital, surrounded by mountains, some snow-capped. The Hotel has been renovated several times and its unique architecture earned an award from the city. It has three floors of rooms and a small seven-story tower with the roof of the world famous restaurant where you can delight your palate with exquisite cuisine or Ecuador. The Hotel has the green and recreational area's largest hotels in town, and parking for 150 vehicles and porte cochere for buses. It also has a swimming pool, steam room and sauna in addition to the excellent service that offers first-class hotel. 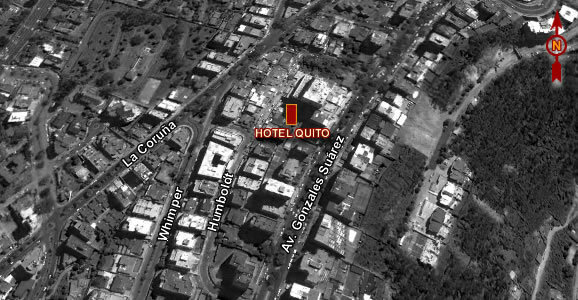 Quito Hotel has comfortable rooms with a panoramic view of the city of Quito. Each of them have been carefully decorated and equipped to provide maximum comfort and a quiet and relaxing stay. All rooms have cable television, radio, safe, hair dryer, local newspaper, room service, cold drinks and wireless internet.